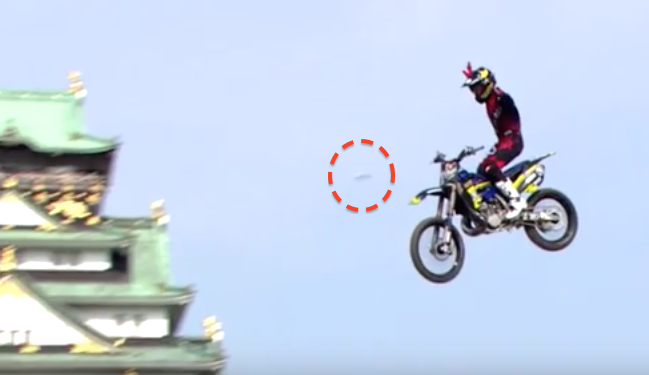 UFO SIGHTINGS DAILY: UFO Shoots Below Motorcycle While Jumping On Video! Dec 2016, Video, UFO Sighting News. UFO Shoots Below Motorcycle While Jumping On Video! Dec 2016, Video, UFO Sighting News. Date of sighting: Unknown 2016? Location of sighting: Unknown China? 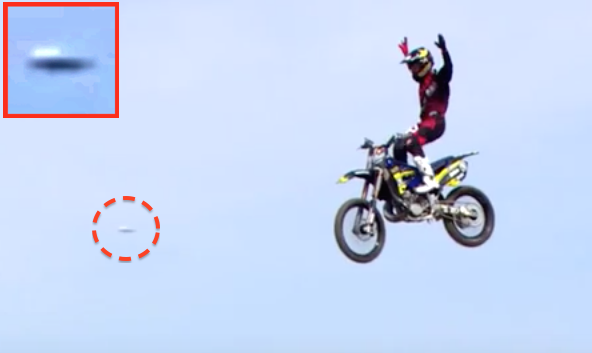 There is very little about this video we know for sure, but its unique in that its a motocross biker thats making an unusually dangerous jump. As the rider gets into mid jump, a UFO shoots past him. Why? Because he is risking his life doing what he loves, and aliens love that. Thats something that they do not fully understand...taking risks. Aliens have lifetimes that are either incredibly long, or infinite, but accidents do take their lives...so they calculate the risks of everything in their heads before they do anything. Imagine calculating risks as you cross the street, then again as you pass a homeless guy talking to himself, then again as you walk under a construction crane (lots in my neighbourhood). Thats what they do. They calculate the odds before they ever take a risk, but no humans. That makes us unique and worthy of more studying.